Monarch Precious Metals is one of the most unique mints out there. The mint’s hand-stamped and hand-poured products are sought out by collectors and investors who want inexpensive bullion products that are still great to look at. While Monarch rarely puts a mintage cap on their products, you won’t want to miss out on your opportunity to get the 2 oz Monarch Tombstone Black Widow Silver Bars from Silver.com, as they are only making 999 of them. Individual bars ship in plastic sleeves. Limited mintage of only 999 bars! Features the image of a Black Widow spider. Reverse shows the Monarch Precious Metals logo. Black Widow spiders are viewed as one of the most dangerous spiders in the United States. They are well-known for the little red, hourglass shaped dot on their backs. These spiders are actually part of a larger genus of spiders that contains 31 different species. In this genus are other spiders that are well-known in other parts of the world. The Button Spiders in Africa and the Redback Spider of Australia are closely related to the Black Widow. These Monarch Silver Bars have been polished with an antique finish that gives them an old, spooky appearance. Every silver bar from Monarch is hand-stamped and hand-poured, which makes them truly unique pieces. 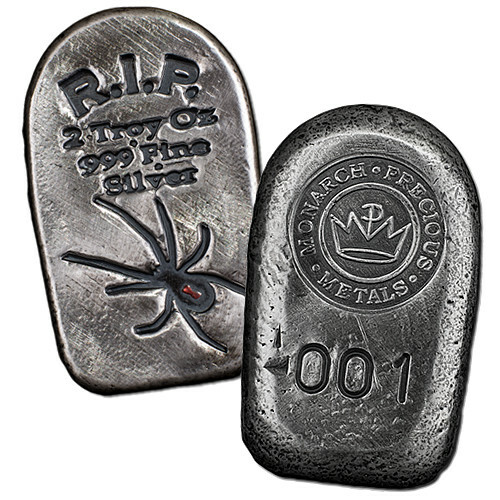 The 2 oz Monarch Tombstone Black Widow Spider Silver Bars have a mintage that is limited to just 999 bars. They will not make any with serial number past this point, so they are a rare bar that won’t be available for long. 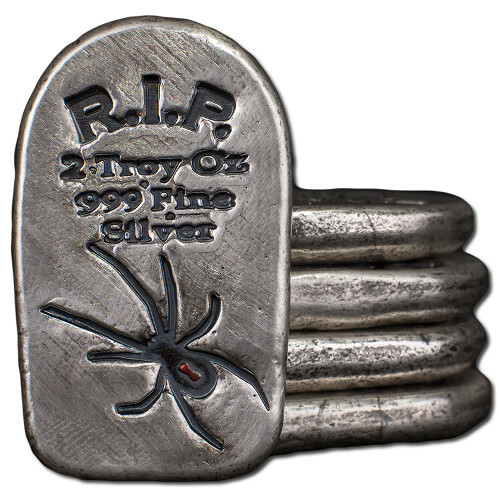 The obverse of each of these bars features the outline of the spider with the iconic red hourglass shape on its back, as well as “R.I.P.” The metal content, weight and purity can also be found on this side of the silver bar. The reverse bears the Monarch logo, which is the initials of the company formed into a crown. At the bottom, you will see the serial number of the bar. Each one will have a unique number. Monarch Precious Metals opened in Southern Oregon in 2008. All of the mint’s products are at least .999 fine silver or gold. Every piece is hand-poured and hand-stamped to give them all a traditional look.